Tomorrow, July 1, 2006, a law will go into effect for Alabama. It will "...protect pregnant women and their unborn children from acts of violence. The measure holds criminals who kill or injure a mother's baby accountable for two crimes when he attacks a pregnant woman. The law applies throughout pregnancy and makes the state one of 24 to protect women during all nine months of pregnancy and one of 34 that offer legal protection through all or part of pregnancy." This was previously signed into law by Governor Riley back in April 2006. Last night I just finished "Mother Angelica" by Raymond Arroyo. At approximately 320 pages, it took me a significant amount of time because of work and other things that forced me to put the book down. Overall, the book was good. I really respect Mother Angelica now. Before reading this, I never thought about everything she experienced and did in her life. She came from a poor family and just barely survived. As a child, she was miraculously healed through the intercession of St. Thérèse of Lisieux. Mother Angelica entered a Canton Convent even though her mother strongly disapproved. Later on, it took tremendous work just to establish her convent in Indiana. Then she worked to spread the Gospel through writing. After all of this came EWTN and the world's first Catholic shortwave radio station called WEWN. She went further and created another convent in 13th Century style. All of this was done trusting in God. She started off with nothing with each project and left the rest to God. For that she encountered much debate and problems mainly from several liberal US bishops. If you are a fan of EWTN, this book is a must read. 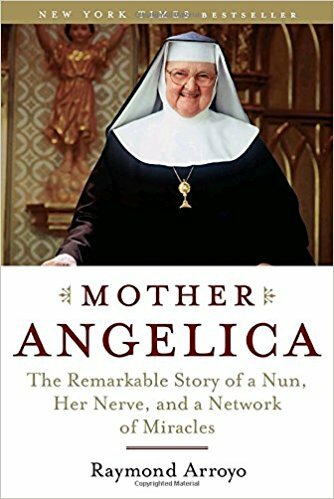 If you don't have the time but want to learn more about the book, check out the CatechismClass Book Summary on "Mother Angelica". 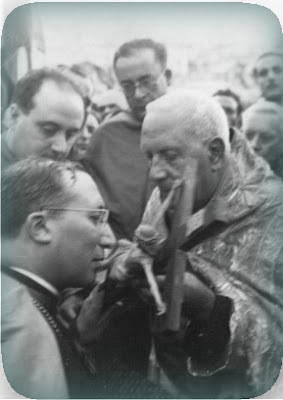 The Eucharist is only valid when consecrated by a validly ordained priest, which is not possible for the protestants. 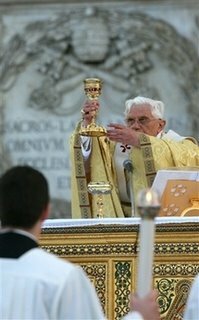 I ask for prayers that all protestants, non-believers, & other non-Catholics will see the Truth of the Sacrament and embrace it. On June 27, 2006, the Diocese of Joliet, IL welcomed J. Peter Sartain, 54, as the fourth bishop of the diocese. 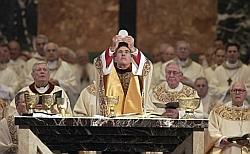 He replaces Bishop Joseph Imesh who had to retire because he reached the mandatory retirement age of 75. 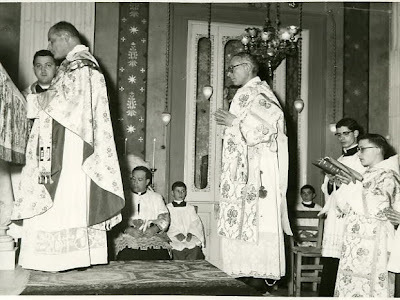 Bishop Imesh has led the Diocese of Joliet since 1979, and was no supporter of the Traditional Latin Mass or Traditionalism in general. Bishop Sartain appears to be a wonderful man, and I'm extremely happy that Illinois has this good bishop now. 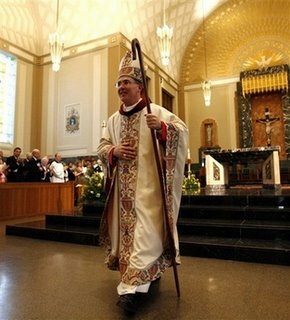 Bishop Sartain was previously the Bishop of Little Rock since 2000. 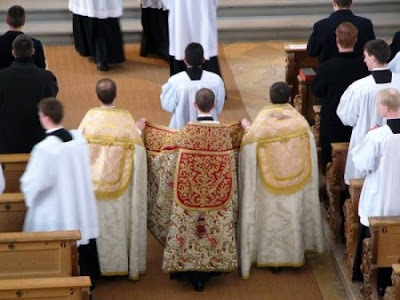 In Little Rock he allowed four Tridentine Masses. Right now the Diocese of Joliet has zero, so please pray that the people there will be able to experience the Tridentine Mass. Please pray for Bishop J. Peter Sartain as he leads his 600,000 member flock. The Catholic Church honors many, many saints and today is one of principal importance since ancient times. Today, June 29, we celebrate the Feast of Sts. 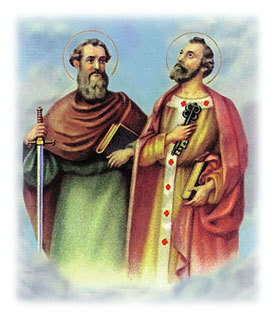 Peter and Paul, who both loved God so fervently they died for the One True Faith. Can we imitate the humility of St. Peter who was crucified upside down since he claimed that he was unworthy to die in the same manner as Our Lord. 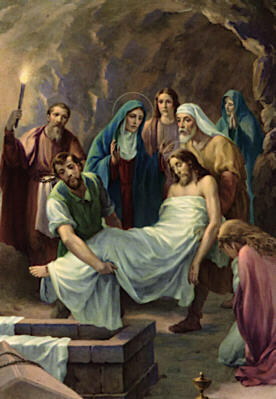 Just as in bygone days Jesus slept in the bark that was on the point of sinking, so Peter was sleeping quietly on the eve of the day fixed for his death. Tempests and dangers of all kinds are not spared, in the course of ages, to Peter’s successors. But never is there seen in the bark of holy Church the dire dismay which held aghast the companions of our Lord in that vessel, tossed as it was by the wild hurricane. Faith was then lacking in the breasts of the disciples, and its absence caused their terror. Since the descent of the Holy Ghost, however, this precious faith, whence all other gifts flow, can never be lost in the Church. 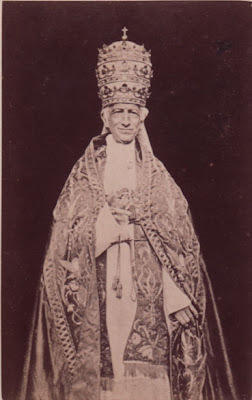 It is faith that imparts to superiors the calmness of their divine Master; faith maintains in the hearts of the Christian people that uninterrupted prayer, and humble confidence which silently triumphs over the world and the elements, even over God himself. Should the bark of Peter near the abyss, should the Pilot himself seem to sleep, never will holy Church imitate the disciples in the storm of Lake Genesareth. 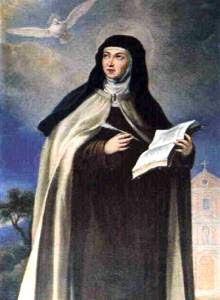 Never will she set herself up as judge of the due means and moments for divine Providence, nor deem it lawful for her to find fault with him who is watching over all: remembering that she possesses within her a better and surer means than any other of bringing to a solution, without display or commotion, the most extreme crises; never ignoring that if intercessory prayer does not falter, the angel of the Lord will surely come at the given hour to awaken Peter and break his chains asunder. Oh, how far more powerful are a few souls that in their unobtrusive simplicity know how to pray, than all the policy and all the soldiers of a thousand Herods put together! The small community assembled in the house of Mary, mother of Mark, were few indeed in number; but thence, day by day and night by night, arose one continual prayer; fortunately, that fatal naturalism was unknown there, which, under the specious pretext of not tempting God, refrains from asking of him the impossible, whenever there is question of the Church’s interests. This pest of naturalism is a domestic enemy harder far to grapple with, at a critical moment, than the crisis itself! To be sure, the precautions taken by Herod Agrippa not to suffer his prisoner to escape his hands do credit to his prudence, and certainly it was an impossible thing asked for by holy Church, when she begged the deliverance of Peter at such a moment: so much so, indeed, that even those who were praying, when their prayers were heard, did not at first believe their own eyes! But the prevailing force of their strength was just in that—namely, to hope against all hope—for what they themselves knew to be holy foolishness; that is to say, to submit in prayer the judgment of reason to the sole view of faith! Can I please have your prayers and advice? For the past day or so I've been rather frustrated and extremely disappointed. I have been engaging people in dialogue. Some of them are atheists that hate you and me for the Truth. Others are Catholics thinking of leaving the Church. And others are Protestants insulting the Truth that we hold dear. On the Catholic Community Forum I was insulted and told I display "contempt, pride, and disobedience." After all of this I am questioning whether I have made a difference through my Internet work on my blog and on the Forum? Our Lord said that not everyone who says Lord, Lord will enter the Kingdom of Heaven but only those that do the Father's Will. Am I doing the Father's will here? Am I truly doing His will? I am trying and I just pray that I am doing His will. I have really been thinking about this lately. And today I read that I display disobedience and pride. I have tried to live humbly this whole past year. In essence, I was told by being called prideful that this past year was a failure. But, that is worked out now. I forgave that person and she issued an apology. I am thankful to move on. But, the world really saddens me because it saddens Our Lord. People just don't care. He died on a Cross with unbearable pain and love for each of us. The King of Kings was mocked and beaten with a rod. He was insulted and led off to be Crucified. The man of love who forgave sinners and healed the sick became the man of sorrows. I can not prove God’s existence with science because God is above science. Science and creation all point to God but can not explain Him 100%. No one can know God 100%. You have to look at the big picture. And you have to understand love. Then you will truly know God. I speak from experience. I’ll come right out and say that I can not prove God with science. God is above science as he is the creator of everything. Aside from the great proven miracles of the Eucharist, Marian apparitions, incorruptible saints, miracles proven through the intercession of saints, and others I can offer no proof. I will let you know that through faith you receive proof. If you honestly believe and trust Jesus then you will receive the proof and feel His presence. I’ve heard this time and time again from atheists that convert to the Catholic Church. I am not desperate for a crutch. God is my Creator and Master. He is a friend, the greatest of them all. Someone that loved me so much He died my death. Quite honestly if Heaven was not possible I would still praise God. If I knew for sure that I was going to hell no matter what, I would still give Him glory because He is my Creator. Those are my honest words. I don’t look at life negatively. Just because one thinks about death it doesn’t make life negative. There are countless positive things each day. For that, they created a post calling us cannibals. They just don't love. This is the real problem in our society - a lack of love. I have discovered that honest love and humility are always lacking in an atheist. I believe they have banned me from commenting there now. If you do comment there, use caution. Don't speak too fiercely but with "veiled" words because their comment policy is against those that believe in spreading the Gospel. 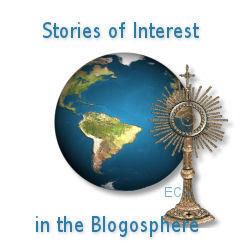 So, tonight I found two more blogs from Catholics that are thinking of leaving the Church for Episcopalians. Is the entire world turning away from Christ? I ask for your prayers for the bloggers from One Foot in the Boat... and Ramblings from the 4th. Please go there and just be a witness for Jesus Christ and the truth of Our faith. Please help them. Please! This comes after finding several blogs attacking the Church and Catholics on our policy for condoms. The world just continues to sin and pull further away for Our King! O, how it hurts me! How it hurts to see that Cross and know they tell him each day: "Jesus, I don't care what you did for me." It hurts to know that some people don't love Him. I just pray that they see the Truth so that on the last day we all may be together forever with Him, who is the Light of the World. 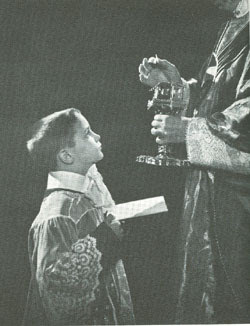 Through excommunication, the most serious of all penalties, the excommunicated person is forbidden to "...have any ministerial participation in celebrating the Eucharistic Sacrifice or in any other ceremonies whatsoever of public worship,to celebrate the sacraments and sacramentals and to receive the sacraments, to discharge any ecclesiastical offices, ministries or functions whatsoever, or to place acts of governance (Canon 1331)" Excommunication, aside from those involved in abortion, applies to priests that reveal the sins of penitents (Canon 1388), people that throw away the consecrated bread or wine or keep them for sacrilegious purposes (Canon 1367), or for a heretic, apostate, or schismatic (Canon 1364). 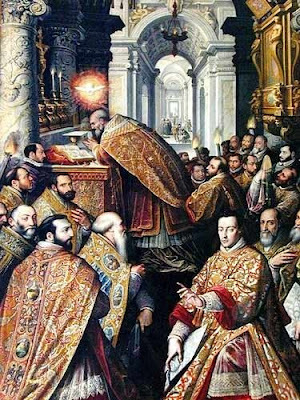 "Wherefore in the name of God the All-powerful, Father, Son, and Holy Ghost, of Blessed Peter, Prince of the Apostles, and of all the saints, in virtue of the power which has been given us of binding and loosing in Heaven and on earth, we deprive (Name) himself and all his accomplices and all his abettors of the Communion of the Body and Blood of Our Lord, we separate him from the society of all Christians, we exclude him from the bosom of our Holy Mother the Church in Heaven and on earth, we declare him excommunicated and anathematized and we judge him condemned to eternal fire with Satan and his angels and all the reprobate, so long as he will not burst the fetters of the demon, do penance and satisfy the Church; we deliver him to Satan to mortify his body, that his soul may be saved on the day of judgment." The priests responded: "Fiat, fiat, fiat" (Let it be done), and all, including the pontiff, cast their lighted candles on the ground. A notice is sent in writing to the priests and neighboring bishops of the name of the one who has been excommunicated and the cause of his excommunication, in order that they may have no communication with him. Although he is delivered to Satan and his angels, he can still, and is even bound to repent. The Pontifical gives the form for absolving him and reconciling him with the Church. 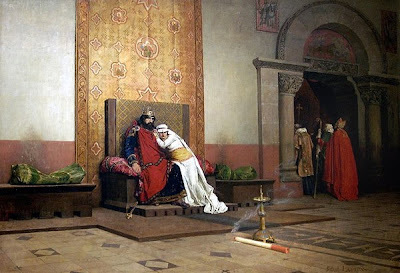 Image Source: L'Excommunication de Robert le Pieux (The Excommunication of Robert the Pious), a painting by Jean-Paul Laurens. This morning I received an email concerning this post of mine: Susan Tassone on Purgatory. I received my information for this post from an email from the Yahoo Group that prays for the Holy Souls. 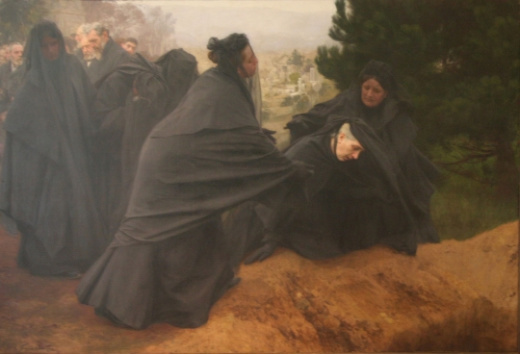 I wrote in that post: "Before she died, an interview was conducted with her about her work to help the souls of those in purgatory. I highly recommend this interview." Today I received an email entitled "Susan Tassone is very much alive!" It was from someone that attends Mass with her. 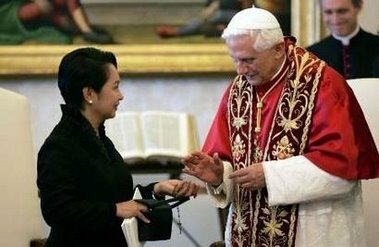 Right now, Susan Tassone is working hard to get donations for poor third world parishes who in turn offer up Masses for your intentions (family members who may be in purgatory). Please say a prayer for Susan's wonderful work for Christ and for her health! "I serve Jesus twenty-four hours a day. Whatever I do is for Him. And He gives me strength." 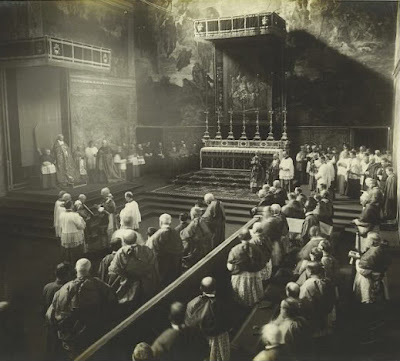 "Each holy Mass heard with devotion, produces marvelous effects in our souls, spiritual and material graces, that we ourselves do not know. For such purposes do not spend your money uselessly, make a sacrifice of it and come here to hear holy Mass." "It would be easier for the earth to exist without the sun than without the holy sacrifice of the Mass." 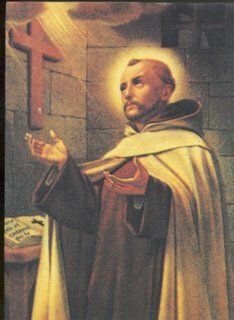 St Irenaeus of Lyons, martyr, was born around c. 130 AD in Asia Minor and raised as a Christian. He was a student of St. Saint Polycarp of Smyrna. 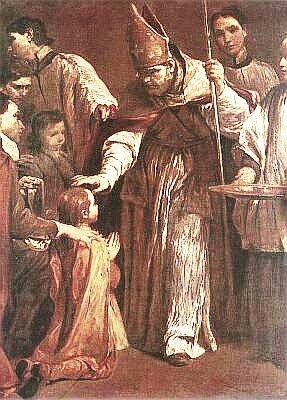 In 177 AD, St. Irenaeus became a priest and eventually became the second Bishop of Lyons following the martyrdom of Saint Pothinus. St. Irenaeus worked intensely to counter to claims of Gnosticism by basing his arguments on the Gospel of St. John. He also emphasized the unity of the Old and New Testaments, and of Christ's human and divine nature. His most well known work is "Against Heresies". 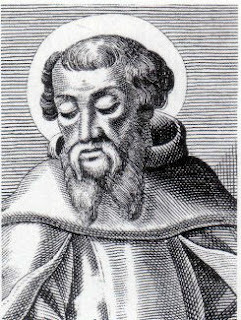 For his work, St. Irenaeus was murdered for the faith in 202 AD in Lyons, France. In 1562, Calvanists destroyed his relics and tomb. 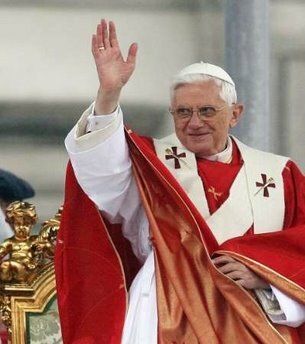 He is a Father of the Church. Father, give perfection to beginners, understanding to the little ones, and help to those who are running their course. Give sorrow to the negligent, fervor to the lukewarm, and a good consummation to the perfect. For the first time since the foundation of our country, the United States may have less than 50% of its population as Protestants. From 1993 to 2002, Protestants dropped from 63% of the population to 52% of the population. According to the researchers, it will drop below 50% in the next two years. Catholics remained steady at 25% of the population. Unfortunately, the number of people claiming no religion has climbed from 9% to 14%. 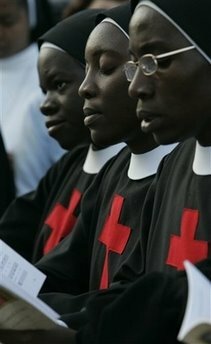 We desperately need to pray that these people see Jesus Christ and see the full truth of the Catholic faith! The number of people adhering to Islam, Orthodox Christians, interdenominational Christians and native-American faiths rose from 3% to 7%. The number of people claiming the Jewish faith remains just below 2%. Note: Protestants are defined as "all post-Reformation Christian churches, such as Baptist, Methodist and Episcopalian, including Mormons and New Age Spirituality adherents." The Collar book tour continued this past weekend with an excellent event in Colorado hosted by one of the five main characters in the book, Father Don Malin. Today's Washington D.C reading at the C.I.C. (1501 K Street, NW - 202-783-2062) has been postponed by the heavy rains that have deluged the capitol and will be rescheduled for mid-July. I will keep you posted as to the new date. As always, please keep me posted with any comments you may have about the book especially thoughts about getting the word out there. 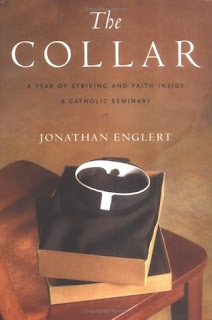 If you have enjoyed The Collar and think that it's a book others should read --please tell people about it and the website! The child Jesus has just seen the angels who have shown him the instruments of his passion. St. Michael the Archangel holds the lance and gall-sop. St. Gabriel the Archangel holds the Cross and the nails. Frightened by the sight, Jesus has run to his mother’s arms so quickly that he almost lost one of His tiny sandals. It dangles from his foot. Mary holds Him lovingly but her eyes look at us - pleading with us to avoid sin and love Her Son. 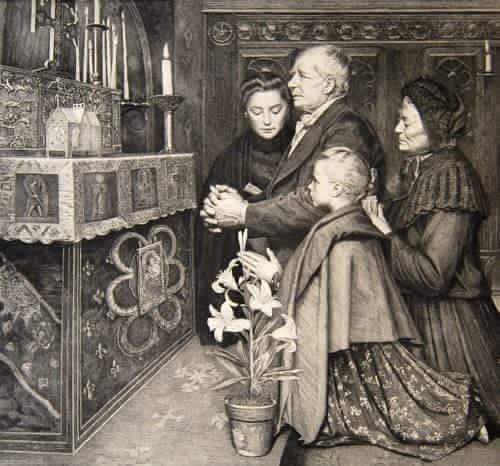 His hands are in hers to show that, as a child, Jesus placed Himself in Mary’s hands for protection and to remind us that He now has placed into Her hands all graces, to be given to those who turn to His mother and ask. The star on Mary’s veil shows her to be the one who brought the light of Christ to the darkened world - the beacon that leads the way to Heaven. The falling sandal symbolizes a soul clinging to Christ by one last thread--devotion to Mary. The golden background is symbolic of Heaven and shines to show the heavenly joy Jesus and His mother can bring to tired human hearts. Almighty and merciful God, Who hast given us a picture of Thy most blessed Mother to venerate under the special title of Perpetual Succor, mercifully grant us to be so fortified, among all the vicissitudes of this wayfaring life, by the protection of the same immaculate, ever virgin Mary, that we may deserve to attain the rewards of Thine everlasting redemption. Who livest and reignest, with God the Father, in the unity of the Holy Ghost, God, Forever and ever. R.Amen. According to today's LifeNews Report, Warren Buffett, the CEO of Berkshire Hathaway and the second richest man in the world, will donate 80% of his fortune to the pro-abortion foundation set up by Microsoft founder Bill Gates and his wife. Buffett plans to give them 12,050,000 in Class B shares of Berkshire Hathaway. One share sells for $3,000, and this would give the Gates foundation another $37 billion. The Gates Foundation has given the Planned Parenthood Federation of America almost $12.5 million since 1998. These funds are used to persuade teenagers to support abortion as well as advance abortion in the United Nations. The International Planned Parenthood abortion business has received almost $21 million from the Gates foundation over the last seven years. These funds were used to kill unborn babies in third world countries. This is horrible, horrible news. I ask you to contact the Gates Foundation and urge it to stop supporting Planned Parenthood and abortion. Earlier this year, Sally Jacobsen, a British literature professor at Northern Kentucky University, led a group of students in destroying 400 crosses set up on campus to be a memorial for the 43 million unborn children that have been murdered from abortion. She was charged with theft, criminal mischief and criminal solicitation. However, the charges have been dropped! She has just apologized for her actions and plans to make a donation to a local maternity home that helps pregnant women. Jacobsen is also paying the Northern Right to Life, the student pro-life group, for the costs of the Cross display that was destroyed. "I apologize to [the group and its members] for dismantling [the display]," Jacobsen wrote. "I did not realize I was interfering with Northern Right to Life's freedom of speech and I deeply regret having done so." Join in Prayers for the Elections! Fr. Frank Pavone is asking people all around the country to join him in prayer. He is asking voters to pray the Rosary from July 4th all the way to Election Day in November. We must pray for the successful election of pro-life candidates. Confession by Phone? by Internet? I've heard a question asked recently whether or not Confession by telephone or Internet is permitted. The answer is of course no. As we see in the Gospels, it is about a personal encounter with Jesus Christ that matters. In Confession we not only confess our sins but we humble ourselves by kneeling down and begging for mercy. The Prodigal Son did not call from across the field: "Forgive me." Rather, the Gospel says, the Son got up and went back to his father. While he was still a long way off, his father caught sight of him, and was filled with compassion. He ran to his son, embraced him and kissed him (Luke 15:20). In Confession Jesus Christ runs back to us and pours grace into our souls. It is this personal encounter that matters. Update (June 24, 2006): President Gloria Arroyo of the Philippines has signed the bill into law! She met with Pope Benedict XVI on June 26, 2006. The Philippines Government decided to abolish the death penalty last Wednesday. AsiaNews reported Bishop Pedro Arrigo, chairman of the Episcopal Commission of Prison and Pastoral Care, said: "It is very important that both the Senate and the House of Representatives approved separate bills to abolish the imposition of the 1994 death penalty law." According to the International Commission of Catholic Prison Pastoral Care, around 124 countries have stopped executions. Though, it is not a mortal sin to excommunicate a criminal, nor even a sin at all. Even in the case of the death penalty the State does not dispose of the individual’s right to life. Rather public authority limits itself to depriving the offender of the good of life in expiation for his guilt, after he, through his crime, deprived himself of his own right to life. 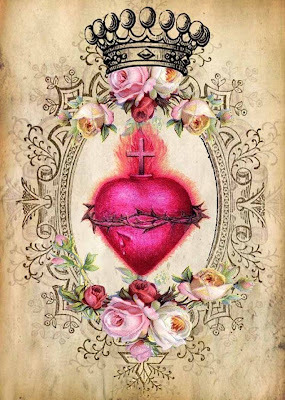 MOST LOVING Jesus, I humbly beseech Thee that Thou wouldst Thyself offer to Thine eternal Father, on behalf of the Holy Souls in Purgatory, Thy Most Precious Blood, which poured forth from the Sacred Wounds of Thine adorable Body, together with Thine agony and death. And do thou likewise, O sorrowful Virgin Mary, present unto the Heavenly Father, together with the dolorous passion of thy dear Son, thine own sighs and tears, and all the sorrows thou didst suffer in His suffering, in order that, through the merits of the same, refreshment may be granted to the souls now suffering in the fiery torments of Purgatory, so that, being delivered from that painful prison, they may be clothed with glory in Heaven, there to sing the mercies of God for ever and ever. Amen. Absolve, O Lord, the souls of all the faithful departed from every bond of sin, that by Thy gracious assistance they may deserve to escape the judgement of vengeance and enjoy the blessedness of everlasting light. Amen. I ask you to say this prayer for all that still live in darkness and do not see the great joy of Jesus Christ! On the night before your passion you were taken from us, beaten and mocked and condemned to death. Bound and beaten on your precious head, the very head that lay in a beautiful manager in Bethlehem. Your back was ripped open in the Scourging, and on the road to Calvary so many hated you; you almost died on the way. Your precious face was disfigured - your body beaten and ripped apart. O Lord, your precious hands which worked so many wonders, were pierced. On that day Lord, you liberated me. May your blessings be upon me and transform me on my pilgrimage to Life Everlasting. May the grace and joy of Christmas and Easter enkindle an eternal flame in my heart for love of you and neighbor that shall never abate. And, permit me O Lord, to die in love of Thee for Thou hast died for love of me. O Lord, so many hate you. So many call you false and a liar. So many pretend as if you ascended to Heaven and left us here - alone. 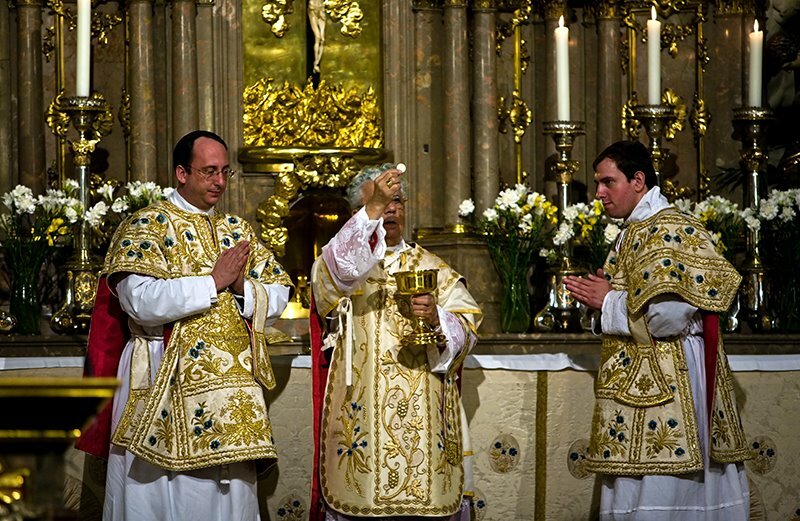 So many pretend the Eucharist is not truly YOU. So many hate the good of your Church and deny your eternal word of scripture; so many utter lies against your faithful. Lord, so many ignore you. They refuse to acknowledge you, and they practice political correctness instead of acknowledging You as the only God to have worked wonders. But, You, O Lord, are the only truth. You are the only light on our journey. If I died today, would I be no more? No! 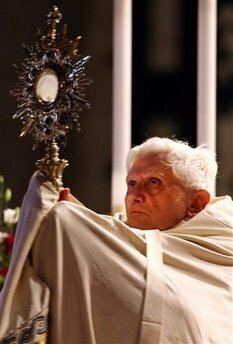 For the miracles you worked are forever recorded in scripture, the miracle of the Eucharist is ever before us. May your light shine upon those that hate you Lord. For, O Lord, your skin was ripped open for them. Your blood poured forth from your heart for them. It was by your Cross alone we are saved. The God of all Creation truly took flesh and mounted a tree to redeem our disfigured race. What love! And what greater love is there than truly giving yourself to me in the Holy Eucharist each and every Mass! Lord, you need nothing as You alone are perfect. Please, permit me, if you will, to offer up the sacrifices in my life to you in reparation for those that hate you, my best friend, my Love, my All. O Lord, you let your apostles help you in the miracles of the loaves, permit me to offer my small sacrifices in union with Your perfect gift on the Cross. 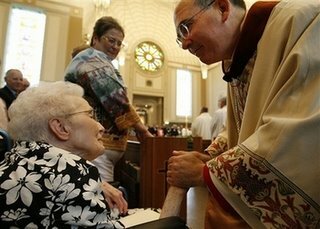 May my sufferings offered for you bring one soul to the truth of your Church. O Lord, grant that my work may produce much fruit and at the end, when I leave this world, you may say, "Well done, my good and faithful servant." Lord, I love you. Forgive us all, my Crucified Lord. Forgive us, for you are the Savior of the World. The US Catholic population is going to take a significant jump by 2025, in large part due to immigrants from Latinos. It remains to be seen if immigration reform will affect this to a large degree. Similarly, these statistics do not reveal the devoutness of adherents. "Catholic Latinos will likely increase to 40 million in 2025, more than triple the 13 million in 1990. Total growth in the U.S. Catholic population will amount to 29 million by 2025. Virtually all of the growth (26 million) will be due to the Hispanic population. Proportionally, their share of the Catholic population will double, to 48%, over the 35-year period." Matthew 5:28- "But I say to you, everyone that looks at a woman with lust has already committed adultery with her in his heart." Matthew 8:11- "I say to you, many will come from the east and west and will recline with Abraham, Issac and Jacob at the banquet in the kingdom of heaven." Matthew 8:12- "...but the children of the kingdom will be driven out into the outer darkness, where there will be wailing and grinding of teeth." Matthew 10:22- "You will be hated by all because of my name, but whoever endures to the end will be saved." Matthew 19:24- "Again I say to you, It is easier for a camel to pass through the eye of a needle than one who is rich to enter the kingdom of God." John 3:16- "For God so loved the world that he gave his only Son, so that all who believe in him might not perish but have eternal life." John 3:17- "For God did not send his Son into the world to condemn the world, but that the world might be saved through him." John 6:35- "Jesus said to them, 'I am the bread of life; whoever comes to me will never hunger, and whoever believes in me will never thirst.'" John 8:12- "Jesus spoke to them again, saying, 'I am the light of the world. Whoever follows me will not walk in darkness, but will have the light of life.'" John 21:29- "Jesus said to him, 'Have you come to believe because you have seen me? Blessed are those who have not seen and have believed.'" James 3:26- "For just as a body without a spirit is dead, so also faith without works is dead." 1 John 1:5- "...God is light, and in him there is no darkness at all." 1 John 2:4-5- "Whoever says, 'I know him,' but does not keep his commandments is a lair, and the truth is not in him. But whoever keeps his word, the love of God is truly perfected in him." 1 John 2:9-11- "Whoever says he is in the light, yet hates his brother, is still in the darkness. Whoever loves his brother remains in the light, and there is nothing in him to cause a fall. Whoever hates his brother is in darkness; he walks in darkness and does not know where he is going because the darkness has blinded his eyes. 1 John 2:15-17- "Do not love the world or the things of the world. If anyone loves the world, the love of the Father is not in him. For all that is in the world, sensual lust, enticement for the eyes, and a pertentious life, is not from the Father but is from the world. Yet the world and its enticement are passing away. But whoever does the will of God remains forever." 1 John 2:18- "Chidren, it is the last hour; and just as you heard that the anitchrist was coming, so now many antichrists have appeared. Thus we know this is the last hour." 1 John 2:22- "Who is the lair? Whoever denies Jesus is the Christ. Whoever denies the Father and the Son, this is the antichrist." May our Lady guard us while bringing us closer to the Heart of her Son. The image of the Immaculate Heart goes back to Luke 2:35, as we recall the sword of sorrow that pierced Mary's heart. It was our sins that crucified Our Savior, which tore a sword of sorrow through his Mother Mary. As Mary revealed at Fatima in 1917, the thorns surrounding her heart are a symbol of sins. 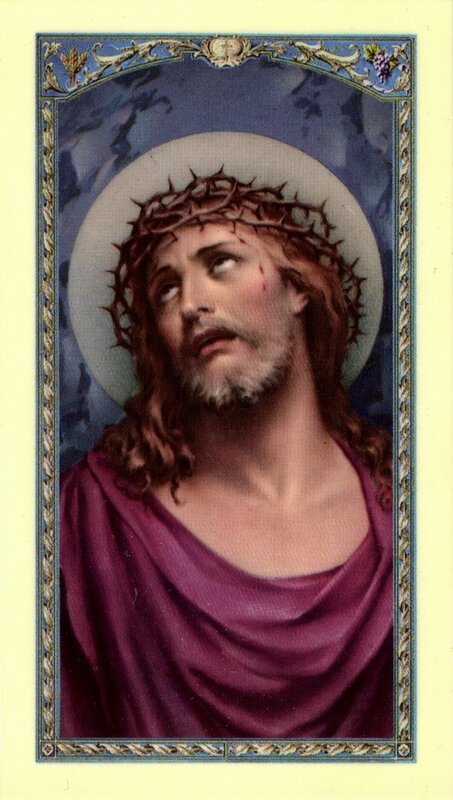 Each time we offend our Lord and crucify Him, we further increase the pain His Mother felt beneath the Cross. At Fatima Mary said: "Jesus wishes to establish devotion to my Immaculate Heart in the world. I promise salvation to those who embrace it. Tell everybody that God grants graces through the Immaculate Heart of Mary, and that they must ask them of her. Tell them that the Heart of Jesus wishes that by His side should be venerated the Immaculate Heart of Mary. Tell them to ask peace through the Immaculate Heart of Mary; God has placed it in her hands." 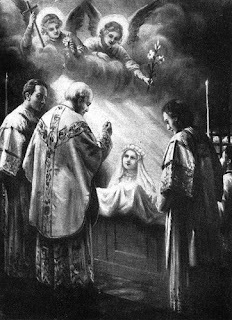 Today is the Octave Day of the Assumption in the pre-1955 Calendar. We, therefore, kneel before you to manifest the sorrow we feel for the grievances that people cause you, and to atone by our prayers and sacrifices for the offenses with which they return your love. Obtain for them and for us the pardon of so many sins. Hasten the conversion of sinners that they may love Jesus and cease to offend the Lord, already so much offended. Turn your eyes of mercy toward us, that we may love God with all our heart on earth and enjoy Him forever in heaven. Almighty everlasting God, Who in the heart of the Blessed Virgin Mary didst prepare a dwelling worthy of the Holy Ghost: grant in Thy mercy, that we who with devout minds celebrate the festival of that immaculate heart, may be able to live according to Thine own heart. Through our Lord...in the unity of the same Holy Ghost. While I was searching the Internet for the best site to find a copy of the Liturgy of Hours, I found the website for the Community of the Monks of Adoration. It is a contemplative order following the Rule of St. Augustine. 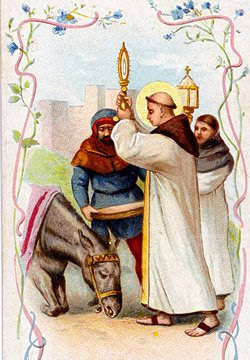 They wear a gray tunic and scapular with a hood, a black rosary worn on the belt, and a medallion with the symbol of their community (the photo to the left). While on the site, I read that the Monks of Adoration are in need of money for a new monastery building. They desperately need the money, so they are asking that everyone that visits their website to participate in the BUCK A BRICK program. They are asking readers to send them one dollar. That's all they ask for! Please, visit their website and send a dollar to them today. A dollar isn't worth much, but if everyone of their millions of visitors sends a dollar, they will have a new monastery. "Do not store up for yourselves treasures on earth, where moth and decay destroy, and thieves break in and steal.But store up treasures in heaven, where neither moth nor decay destroys, nor thieves break in and steal. For where your treasure is, there also will your heart be." Blessed Mother Teresa: "When you accept a task, do it willingly. If not, don’t accept it!" Padre Pio: "Jesus alone can understand what I suffer when the painful scene of Calvary is enacted before my eyes. It is equally incomprehensible how Jesus can be consoled not merely by those who sympathize with His torments, but when He finds a soul who, for love of Him, asks no consolations and only wants to be allowed to share in his sufferings" (Letters p 377). Today is the Solemnity of the Nativity of St. John the Baptist. Six months before the birth of Our Lord, we celebrate the birth of St. John the Baptist to Zechariah and Elizabeth, Mary's cousin. 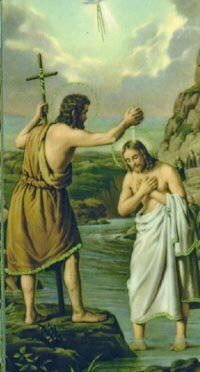 It was St. John the Baptist that prepared the way for Our Lord and bore witness to Him. Now the time came for Elizabeth to be delivered, and she gave birth to a son. And her neighbors and kinsfolk heard that the Lord had shown great mercy to her, and they rejoiced with her. And on the eighth day they came to circumcise the child; and they would have named him Zechariah after his father, but his mother said, "Not so; he shall be called John." And they said to her, "None of your kindred is called by this name." And they made signs to his father, inquiring what he would have him called. And he asked for a writing tablet, and wrote, "His name is John." And they all marveled. And immediately his mouth was opened and his tongue loosed, and he spoke, blessing God. And fear came on all their neighbors. And all these things were talked about through all the hill country of Judea; and all who heard them laid them up in their hearts, saying, "What then will this child be?" For the hand of the Lord was with him. O God, Who hast made this day worthy of honor by the birth of blessed John: grant to Thy people the grace of spiritual joys, and direct the minds of all the faithful into the way of eternal salvation. Through our Lord. "Being Christian is not the result of an ethical choice or a lofty idea, but the encounter with an event, a person, which gives life a new horizon and a decisive direction. Saint John's Gospel describes that event in these words: “God so loved the world that he gave his only Son, that whoever believes in him should ... have eternal life” (3:16)...Since God has first loved us (cf. 1 Jn 4:10), love is now no longer a mere “command”; it is the response to the gift of love with which God draws near to us." "Love is indeed “ecstasy”, not in the sense of a moment of intoxication, but rather as a journey, an ongoing exodus out of the closed inward-looking self towards its liberation through self-giving, and thus towards authentic self-discovery and indeed the discovery of God: “Whoever seeks to gain his life will lose it, but whoever loses his life will preserve it” (Lk 17:33), as Jesus says throughout the Gospels (cf. Mt 10:39; 16:25; Mk 8:35; Lk 9:24; Jn 12:25). In these words, Jesus portrays his own path, which leads through the Cross to the Resurrection: the path of the grain of wheat that falls to the ground and dies, and in this way bears much fruit. Starting from the depths of his own sacrifice and of the love that reaches fulfilment therein, he also portrays in these words the essence of love and indeed of human life itself." Do the Laity Pray the Liturgy of the Hours? "With, it seems, increasing frequency I come across lay people who are daily praying The Liturgy of the Hours. That is required for priests and members of religious communities. 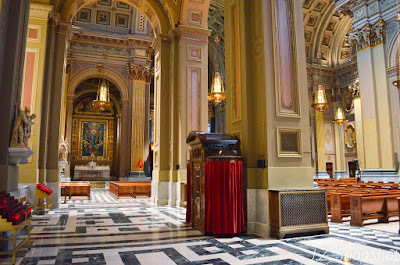 The daily office, as it is called, varies according to the traditions of some religious orders and in most communities is prayed in common or, as it is said, in choir. It is an encouraging thing that lay people, and especially younger lay people, are taking up this spiritual discipline. And even more encouraging when they are able to pray the office with others, as in the family." Pray the Liturgy of the Hours! Dear Holy Trinity, united in perfect love. You are three conceived in one Being. Oh, Holy Trinity, come down upon me for I, Your poor miserable servant call upon You. 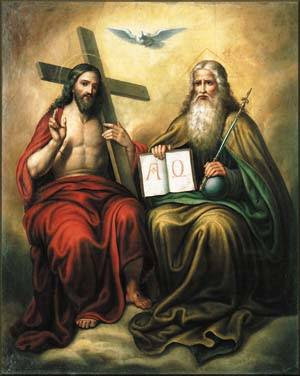 Praised be to the Holy, undivided Trinity. I wanted to post about saints that had animals as pets. Of course virtually all of us know of St. Francis' love for animals, but several other holy men and women had pets. St. Don Bosco had a pet dog in his youth while St. Philip Neri had a cat in his old age. St. Francis of Paola had a pet fish that was cooked one day. So, St. Francis of Paola raised it from the dead by the power of God. Saint Brigid even tamed animals. Back in her time, the law stated that if a thief was in a Church no-one was allowed to arrest him. One day a group of hunters chased a wild boar into Church and wanted to come in and kill it. The men said that the Church refuge rule did not apply to animals. Saint Brigid said the rule did indeed apply, and so the hunters were forced to leave. She then gave the exhausted boar a drink and it ended up living on her personal farm with the cows she owned. 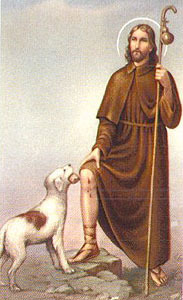 St. Rocco and St Lazarus the Beggar are pictured with a dog, and St. Anthony of Padua even preached to fish that listened to him. St. Francis negotiated with a wolf and even preached to birds telling them to glorify God. St. Jerome had a lion, and St. Giles had a deer. As we can see, kindness towards animals and creation is a sign of holiness and respect to God. Whether or not if we can talk with animals like some saints, we all need to show them respect. Well, after a few hundred dollars less, a new motherboard, and a few hours later, I am fully up and running! I still need to finish copying over my previous files because I had to completely start Windows XP again, so blogging will probably we light for awhile still. However, I am back. Thank you for your prayers. The motherboard for my computer died this morning. I'm writing this from a public computer right now, so I will not be blogging again until the computer is fixed. I took it in to get fixed today and I was told it would be done by next Tuesday. I went home and prayed the Novena to the Infant Jesus of Prague, called on Mary's intercession and the saints, and prayed two decades of the Rosary. I then received a call - it could be ready by the end of tonight! So, whenever it is fixed I will continue blogging! I hope I will get it back tonight or tomorrow at the latest. Dymphna's Well posted a link to an article from CitizenLink. Te Deum has an extensive post on this as well. Over in the Colorado House of Representatives, assistant minority leader Ted Harvey was troubled about plans from the House to honor the 90 year legacy of Planned Parenthood in Colorado. So, he invited a speaker - Gianna Jessen. Gianna Jessen truly succeeded in the American dream. She overcame Cerebral Palsy to one day win a marathon. She is a truly legend. As soon as she finished, The House Chamber "exploded into applause which lasted for 15-to-20 seconds. Gianna had touched their souls. Ironically, Alice Madden, the majority leader and sponsor of the Planned Parenthood resolution, walked over to Gianna and congratulated her." Mr. Harvey then went to the podeum and revealed that Gianna's cerebral palsy was caused from a failed abortion attempt on her 17 year old mother. She was born alive and adopted at the age of 4 after nearly dying. The Speaker then announced, "Representative Harvey, I will allow you to continue your introduction, but not for the purposes of debating a measure now pending before the House." And then there was silence - a deafening silence. I say bravo to Ted Harvey! I hope this changed the minds of some of the representative there. For most people abortion is the murder of someone not seen. They got to see the victim of this genocide for once...it's about time. 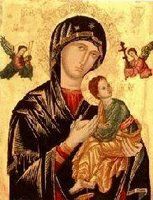 This is the third day of the Novena to Our Mother of Perpetual Help. This Novena is prayed leading up to the feast on June 27. O Mother of Mercy, have pity on me! You are called the refuge and the hope of sinners; be my refuge and my hope. Help me, for the love of Jesus Christ; stretch forth your hand to a poor, fallen creature. I recommend myself to you, and I want to devote myself to your service forever. I bless and thank almighty God, who is his mercy has given me this confidence in you, which I hold to be a pledge of my eternal salvation. Mary, help me. 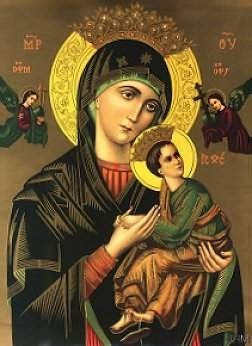 Mother of Perpetual Help, never allow me to lose my God. What is the Chicago Tribune thinking??? The Chicago Tribune has published a shocking article on our faith in France. In France and in almost every other European country, Christianity appears to be in a free fall. 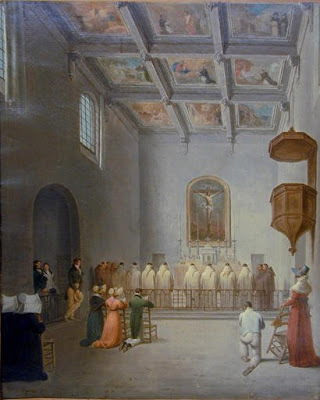 Although up to 88 percent of the French identify themselves as Roman Catholic, only about 5 percent go to church on most Sundays; 60 percent say they "never" or "practically never" go. But Islam is a thriving force. The 12 million to 15 million Muslims who live in Europe make up less than 5 percent of the total population, but the vitality of their faith has led some experts to predict that Islam will become the continent's dominant faith. "Mass is boring," said Odon Vallet, a religion professor at the Sorbonne. "The ceremony isn't very beautiful; the music is bad; the sermon is uninteresting. Mass is for people who have nothing else to do on a Sunday--no sports, no hobbies, no shopping, no entertainment." I guess Mr. Vallet has not been to a Mass in a long time because when I go I witness bread and wine become Jesus Christ. I watch the greatest of all miracles and commemorate the Sacrifice on the Cross. I take part in a event were souls are released from purgatory and graces pour forth like rays of light from the sun. I go there to receive the King of Heaven and earth. Mr. Vallet has no idea at all what he is talking about. My priest gives excellent homilies usually. 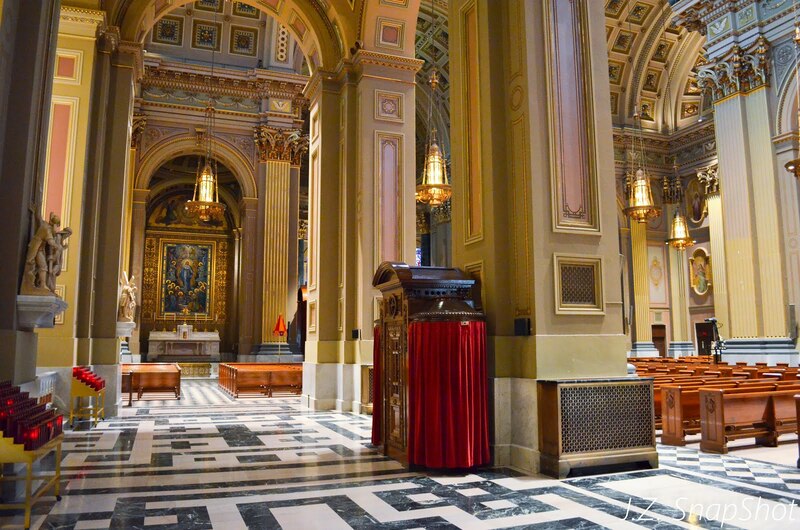 The music can also be so invigorating at some parishes like St. John Cantius in Chicago. And Paris is home to the beautiful St. Nicholas Parish. I think it horrible that France, which was nearly destroyed in World War II, has forgotten that without God they would not be here today. 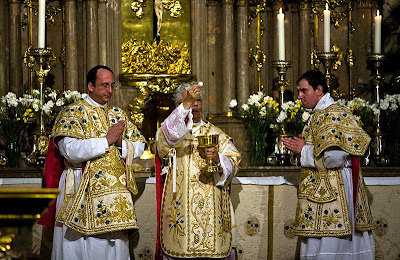 It is horrible that people of there do not appreciate the Holy Sacrifice of the Mass. Update: Last I checked, they are at $143 of a goal of $2,000. They do such great services. Please consider donating anything to help them. If you don't use it, I highly recommend you use MyCatholic.com. It is a customizable Catholic homepage that allows users include news RSS feeds and feeds from numerous blogs including this very own blog. By adding the feeds, you can view the most recent titles from your favorite blogs and click on them to read. You also can add Mass Readings, a Saint for the Day section, local weather, one-minute meditations, and much more information. Right now, MyCatholic is having their semi-annual fundraiser from June 14-23. 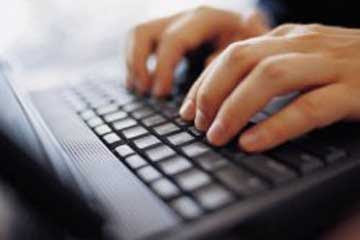 The site goes well out of its way to offer numerous services to its users. Please support them as they hope to reach their modest $2,000 goal. Last Thursday most of the world celebrated Corpus Christi, and Pope Benedict XVI led a Eucharistic Procession through the streets of Rome following an open air Mass at the Basilica of St. John Lateran. 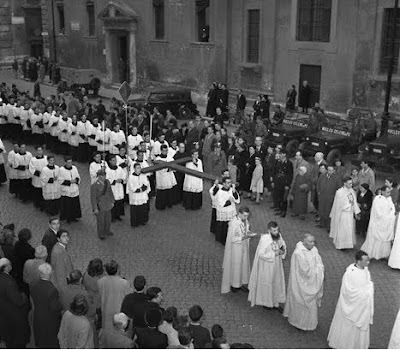 Here are pictures from that solemn procession and the Mass. 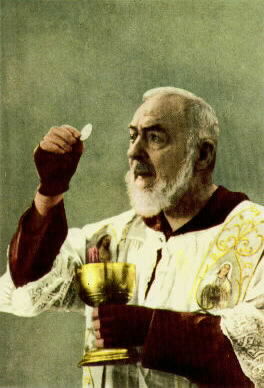 My children, we can never prepare ourselves too much for Holy Communion (St. Padre Pio). 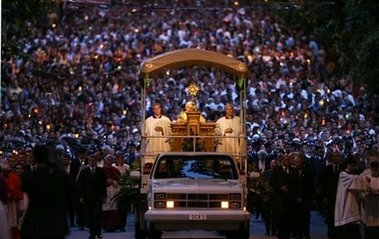 Grassroots Films, the same company that created Fishers of Men, has another new video - this one on Eucharistic processions. Please pray for Auxiliary Bishop Richard Sklba of the Milwaukee Roman Catholic Archdiocese. He was in a car accident yesterday shortly after 1 PM. Retired Deacon John Wargin, 68, was driving and later died at St. Agnes Hospital in Fond du Lac. Please pray for his soul. This is the second day of the Novena to Our Mother of Perpetual Help. 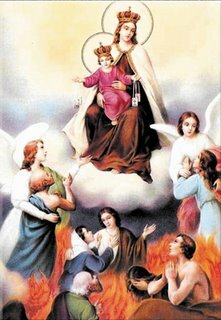 This Novena is prayed for leading up to the feast on June 27. Voters will have the final say on a tough new law that bans almost all abortions in South Dakota. Remember, this law will ban all abortions except when necessary to save a mother's own life. We must pray for this law to be upheld by the people of South Dakota. Pray, pray, and pray. Pray the Rosary from now until November. And, even if it is voted down, there will be no abortions from the day it was signed into law in March until November. Children are being saved. This Novena starts today and is prayed for the next nine days leading up to the feast on June 27. There are now 7 states with such trigger laws in effect that will ban abortion-on-demand as soon as Roe v. Wade is overturned. They are Arkansas, Illinois, Kentucky, Louisiana, Missouri, Nebraska, and Utah. Louisiana Democratic Gov. 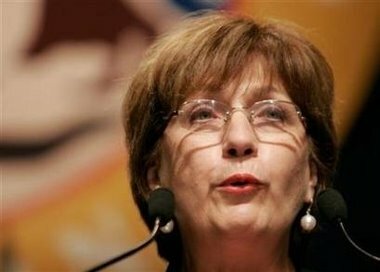 Kathleen Blanco has signed a bill into law in June 2006 that will criminalize abortion AFTER Roe v. Wade is overturned. This new law is known as a trigger law in that it will only take effect after Roe v. Wade is already overturned by the Supreme Court. The law would ban abortions in all cases except to save the life of the mother. South Dakota passed a similiar law in March 2006 except it was to become law immediately; it was not a trigger ban. That law is currently hanging in the balance and awaiting a vote by South Dakota citizens this fall. We need to pray for it's success. "My Jesus, my sweetness, how can I live without You? Come always, My Jesus, come; You alone take possession of my heart"
What is a Catholic Saint?